My Sweet Haven: "Dexter fix"
He has been keeping our primetime viewing entertaining and fun for the last two weeks. I didn't want to go to bed without a "Dexter fix". This is my DIL's fault. He lent Jeff a copy of Dexter while I was in the Philippines. The first thing Jeff wanted to do when we came back was to watch Dexter. I am actually talking about an American TV series about Dexter Morgan, a forensic blood spatter analyst for the Miami Police Department, who also happens to be a serial killer in his free time. Interesting...that was what I thought when Jeff first told me about the story plot. I've always liked to read books about crime thrillers and my choice of DVD movies to watch includes suspense and thrillers as well. Of course I get scared so easily but I find the suspense thriller movies exciting to watch. As a matter of fact, the last Netflix movie we watched together was Wrong Turn 3: Left for Dead. It kept me on the edge of my seat right up to the end. 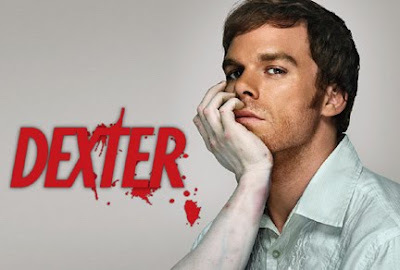 While Dexter belongs to the thriller genre, it's not your typical "chased by some kind of an inbred mutant cannibals in the jungle" type of a show. It's a very well-crafted story, with substance and with engrossing characters to watch. After seeing the first 2 episodes from Season 1, I got hooked! I can't seem to get enough of Dexter. When we finished watching all 12 episodes of Season 1 in 4 DVDs, I was disappointed because I wanted so bad to get a hold of Season 2 DVDs. It wouldn't be until next weekend that we get to visit Dad again so we could also borrow more of his Dexter collection. Luckily, I remember we had Netflix membership. Voila! We instantly watched Episode 1 of Season 2 on my laptop last night. Sweet! I didn't have to wait for a week after all. At first glancesa pics i thought his picking his nose lol. mura ug nanghigugmu mn Jenn hehe. 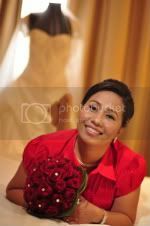 Cut imung profile pic with your hubby mura pang valentines postcard or card. cookbook is diners, drive in and dives by guy fieri i have a few 100 cookbooks this is in my top fav :) i also really love the "best of top secret recipe" since we dont eat out very much i make the same kinds of take out foods but at home and healthier. which kinds of foods do u like? i have so many cookbooks itallian is one of fav :) my husband jokes and says i have many favs. i go to boarders and they have so many sales just look at them and see which ones u like i like ones with LOTS Of pics. betty crocker, better homes and gardens and pillsbury have great america dishes they have so many different cookbooks if you like baking sweets more too. also older church cookbooks are great! we lived in so many places i try to pick up cookbooks from all over since usa has so many different kinds of food! so to make a short answer to your question a little longer...:) diner drive ins and dives has been A++++ so far! I have seen only the first 2 seasons..and I got addicted to all the episodes. I loved it when he almost got caught, and yet, he got away with it.. Dexter is pretty interesting.